In March 2016, a project entitled "Reality, Extinguished/Generated by Science and Culture - Fiction, Institution, Technology and Bodies in the 21st Century" was conducted by the Japan Foundation. This project considered the ways in which we look at "reality" as it continues to change with the development and spread of cutting-edge technologies such as virtual reality (VR) and artificial intelligence (AI), through five inspection tours, workshops, and lecture series. 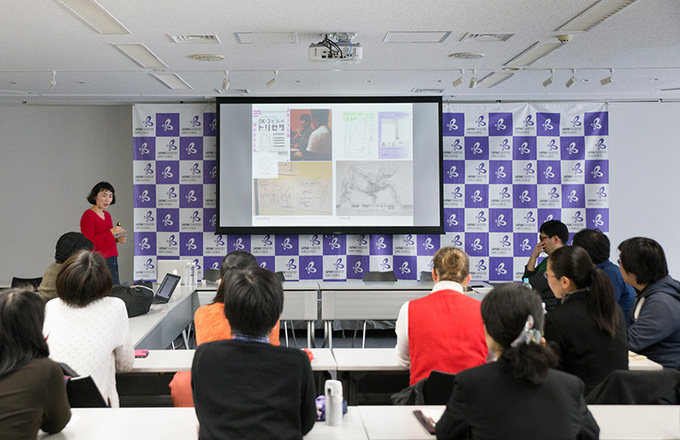 This project was organized for foreign graduate students and researchers on exchange in Japan as part of the Foundation's "Mission Project." One of the speakers at the fourth lecture was Asa Ito. As an associate professor at the Tokyo Institute of Technology's Center for Liberal Arts, she is studying the ways in which people with visual and hearing impairments perceive their bodies, as well as how they grasp the world around them and relate to it, through efforts such as her recent work Me no Mienai Hito wa Sekai wo Douyatte Miteirunoka [How do People without Sight See the World] and her workshop "Designing a Country without Sight." She gave a lecture on sight and perception, providing various examples that she has encountered in the course of her research. She also spoke with the participants at times, and a subject that arose before long was that not only are there differences between people with and without disabilities, but also a diversity in people's preconceptions and values, and a wealth of variation in the images they hold. Esthetics is a discipline to study things that are difficult to convert into language, such as "sense" and "the arts," by expressing with words. It is Dr. Ito's field of research, but her approach to that research is somewhat unique. Dr. Ito: Being a researcher, my main work is writing and studying. However, I feel that it is not enough just to use language to express one's own concepts to people, so I hold workshops, and have teamed up with the artist Kohei Kobayashi to create works. 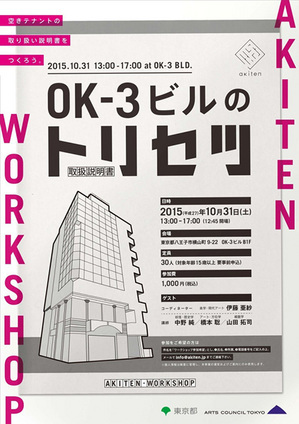 In October 2015, for example, at "OK-3: A User Manual for Buildings," a workshop I planned in Hachioji, I looked at ways of using a single room in a multi-tenant building, which had been left unoccupied for a long time, via three approaches. A cabaret club, reggae bar and more had been through this room, but a dull atmosphere of failure remained; none of these endeavors had been a success. That specific atmosphere is something difficult to quantify in numerical terms, or to put into words and analyze, but I thought it would perhaps be possible to deal with the sensory factors in a workshop environment. Dr. Ito talking about the workshop she planned in Hachioji, "OK-3: A User Manual for Buildings"
Flyer for "OK-3 A User Manual for Buildings"
Dr. Ito invited three researchers to the workshop. One of these was the artist Satoshi Hashimoto. He told her that, at present, culture is propagated from the center of Tokyo to Hachioji on its western edge, but that in the Edo Period, Hachioji was the gateway through which culture entered Tokyo from Kyoto, being propagated to the east, and he realized that Hachioji is interesting if considered from the perspective of direction, so he selected that as their topic. Another of the invitees was the biologist Takuji Yamada, who spoke on the subject of enteric bacteria. For a male of 70 kg, bacteria account for as much as 3 kg, and have such a great influence on the human body that their properties determine a person's personal odor. A person's odor and the smell of the room that they live in are similar in many ways, so the latter seems to be affected by bacteria as well. He thought about the people who had worked in the vacant room, in terms of bacteria. The final invitee was the author and night tour guide Jun Nakano. He spoke about the character of Datsue-ba, an old lady who steals the clothes of the dead at the edge of the Sanzu River in Buddhist mythology. In his lecture, the participants discussed traditions and ways of thinking whereby people of the past perceived the characteristics of places as supernatural presences, such as monstrous creatures. They conducted their workshop based on these three odd lectures, and explored actual ways to use the vacant room. It could be said that the idea of discovering new concepts and viewpoints that differed from those of the past by establishing questions that may appear eccentric on a hypothetical footing, shows one aspect of the current activities of Dr. Ito. Dr. Ito: Let me start by explaining my approach regarding disability. Conventionally, the idea of research into disability tends to make one think of welfare, but I always think of disability as a theory of body. One can consider that the ultimate goal of welfare is to achieve a society where, for example, both people with and without disabilities can live an equal existence in a barrier-free environment. Of course, the welfare-based approach is very important, but I still want to focus on the differences that remain. For instance, people who can see tend to look at their surroundings when they go to the station, while sightless people go to the station by using braille blocks. As such, their actions are the same, yet their actual experiences are quite different. Once, a man in his fifties who had lost his eyesight explained the journey from the station to his home in text. He wrote the journey in the following way: "I cross (the road), then follow the road straight for around 100 m, and come to the smell of an unagi restaurant on the right. As I continue, I then smell a tofu shop." As such, his method for understanding the streets relies on using elements that he can grasp by senses other than sight as landmarks (smell marks? ), and tracing each of these points to his destination (as such, we can assume that he will get lost, even in the vicinity of his home, if he is unable to perceive these things that he has set as markers for himself). 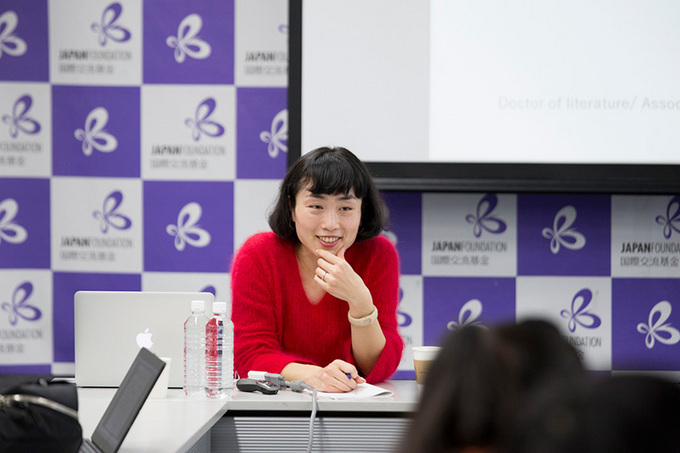 Dr. Ito: Usually, the body of someone without disabilities is a complete whole, whereas for a person with disabilities, it can be perceived as one from which some kind of function has been removed. However, one's body is something which generates a unique meaning, within its relationship to the surrounding environment. The Estonian biologist, Jakob von Uexküll, who was born in the 19th century, called the unique awareness of the world that each being has "Umwelt." Compared with how humans would perceive a flower garden, when a bee perceives the same flower garden, it is likely that only the flowers that hold nectar would stand out. In other words, he hypothesized that the way in which the environment is viewed, and its significance, differs between living beings with different bodily characteristics. Generally, research in the disciplines of the liberal arts is predicated on the human body, but that is an extremely abstracted image of humanity. In reality, there are a large number of differences, such as gender, age, and reflexes, so there should be different awarenesses of the world that correspond to each. In order to think about this, I have continued to conduct research and workshops with people that have disabilities, as their biggest difference is easy to see. 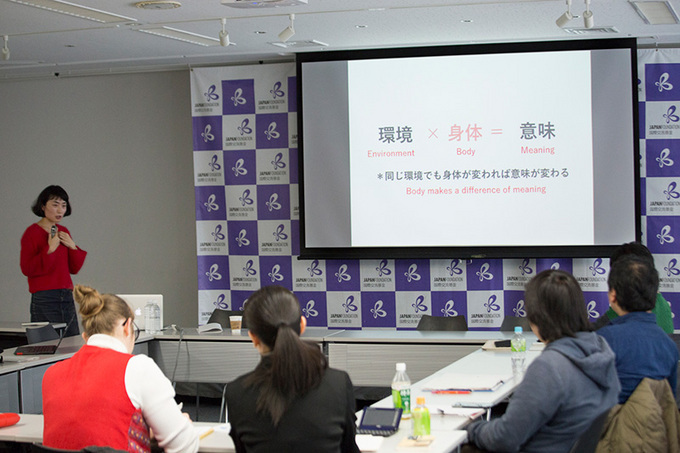 Dr. Ito talks about the body as something that generates unique meaning according to the environment. In the course of her research, Dr. Ito has noticed that there are three methods for viewing the world used by visually-impaired people. One of these is to use senses other than sight, such as touch or hearing. Another is to use tools, like white canes and smartphone voice applications. The third method is to talk about the state of their surroundings with a person nearby, to gain an awareness of the world. The idea of senses other than sight brings to mind "seeing" by ascertaining the position of something with touch, and knowing that there is a wall by using the echoing of sound. Dr. Ito learned through interviews with sightless people that there are various ways of doing this, but attempts to "translate" the ways that they "see" into something that individuals with sight would understand did not always go smoothly. She told us about an episode that occurred when she had lunch with someone who was completely blind from birth. Dr. Ito: People who are completely blind from birth have no experience of having ever "seen." Accordingly, they do not comprehend the world by converting everything together into visual information. This is in the realm of things that people like us, who can see simply, cannot conceptualize. On this particular occasion, I was having a set menu of tempura with a person who has no memories of seeing. We spoke about a range of topics, and I realized that he understood our tempura set menu of many plates and bowls as if it were a "computer desktop." 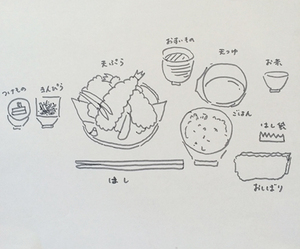 Each of the rice and small bowls were icons, and by moving a cursor as if to click them, he was able to understand the details, which in this case was the fact that it was shrimp tempura. People who can see take everything in in an instant from sight, and receive the various information such as shapes and types. However, in order to act, visually-impaired people begin by ascertaining the important location-related information, after which they access the next, deeper level of information, namely contents. I wonder if perhaps they have a method of organizing information that people who can see normally simply cannot separate. 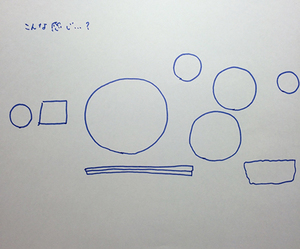 The second method was the use of tools. In this case, Dr. Ito was introduced to social media application that supports sightless people called "Be My Eyes." If a person who cannot see photographs an object, another person who can see, quickly provides a live response about what it is. Dr. Ito: Since the arrival of smartphones, sightless people have been using a lot of applications. Forms of artificial intelligence such as "Siri" and software that reads aloud are representative of this. People that can see simply do not realize that they "see" and "read" simultaneously, but when mediated by a speech application, a new term called automated voice is involved in "reading" for visually-impaired people, and the process of understanding information becomes more multilayered. The third method is to cognize the world through conversation. One can turn it into something "seen with words." There must be many people who remember the pictures of famous musicians hanging on the music room walls in elementary school. Certain visually-impaired people seem to have a unique perception of the picture of Beethoven. Dr. Ito: This person lost his eyesight when he was young, so had never seen the picture of Beethoven, but nevertheless knows the man's stern face. Why, you may ask. It is because the other children used to tell a school ghost story that "his eyes light up at night" and "he's looking this way." He said he had experienced Beethoven's "look" based on their information. There is an interesting subplot to this story. I am sure many of you know this, but Beethoven was not actually a man with such a severe face. Yet the 19th century when he was active was a period of rigid values, in which artists had special skills, and were considered geniuses that lived in an entirely different world to normal people. I think the fact is that "seeing" is not the same for all people. We have a tendency to understand that what I see = correct, but we strongly rely on our unconscious perceived notions, that this "should be like this." Many visually-impaired people have the preconception that "to be able to see is right." Even in a world where "it is not always right," I think we should convey things to our unseeing counterparts. To put it another way, for visually-impaired people, it is not only sensory information that they can see objectively, but also the social meaning and value it contains, that they want to see, or that they are "seeing." 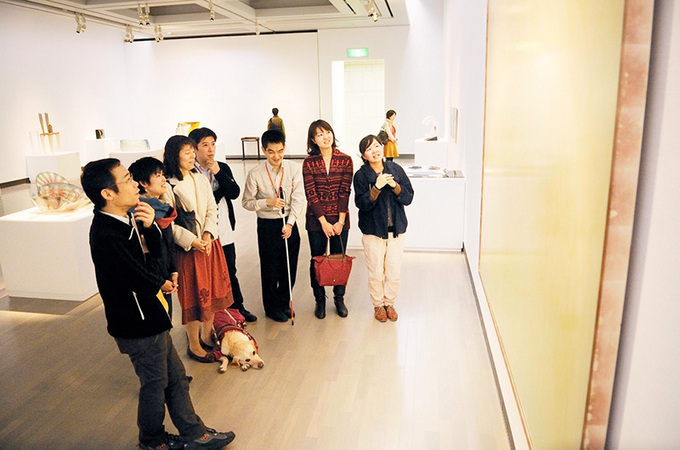 Another project that Dr. Ito is focused on is how we view art, called "social viewing." For this, she created a group of around eight people, some who can see, some who cannot, and together they viewed works of art. The members then explained to each other the elements of the painting. Dr. Ito: Let us take the social viewing of Tadanori Yokoo's work Bride as an example. In the center of the picture, there is a woman wearing a bride's head-dress, so at first, general comments, like "beautiful woman," were heard. However, when they looked at it more and more, they started making comments that implied their own background. For example, the gun shape formed by the thumb and forefinger is called "man's scissors" (for "rock paper scissors"), but that is an expression that only people living in certain areas of Japan can understand. One of the objectives of the social viewing is to reach a conclusion by working together with other participants, while recognizing each of the differences in this way. As another example, Dr. Ito told us about an experience she had in a lesson at a science university, when she showed a work by the American painter Jackson Pollock to her students. He was a leading abstract expressionist and secured a place in art history for his method "action painting," which involves spontaneous applications of paint, but he is not highly rated by students of science. Dr. Ito: The majority of students majoring in science held the impression that Pollock's paintings were "untidy." As I asked them to talk more in detail, they said Pollock's works were "childlike scribbling," "lacking in skill," and "unreproducible." These views seem to be the main reason they have negative impressions to the works. So I mean to say that it is important for scientific research to be reproducible - to reproduce an experience one had today, even if it is by a completely different person, many years from now, in a very different place. Pollock and many of modern and contemporary artists emphasize a sense of presence, of the work being a "one off" or "of right now." This tends to be "seen" as incomprehensible to science students. Like the research of STAP cells, which was a hot topic last year, things without reproducibility are valueless (laughs)! Then we continued to discuss a slightly trickier topic. "What, conversely, has value but no reproducibility?" Through this question, what we reached was sport. For example, a soccer match is something that occurs just once, to determine whether one wins or loses. It is for that very reason that people are crazy for it, and its fairness is retained. Introducing a unique view like this, we can arrive at a conclusion that is not written in any museum on Earth, that "Pollock's action painting is a sport." I think this is one of the ways in which social viewing can be enjoyed, in understanding that a work can deepen interpersonal relationships between participants. After this, Dr. Ito's lecture advanced onward, while interjected with practical examples, such as an impromptu social viewing, together with the attendees, of a painting by the Russian artist, Kazimir Malevich's Painterly Realism of a Football Player--Color Masses in the 4th Dimension. Dr. Ito: The thing that is important in social viewing is that, in regard to enjoying the interpretation, there is no difference between whether one can or cannot see. For example, if one person's interpretation of a work alters other people's views entirely, then the change can be shared by a visually-impaired person. Since nobody is able to look without preconceptions, we can try and comprehend an object initially by applying it to the patterns that we know. That said, by daring to put colors and shapes that we immediately understand into words, an atmosphere where we can have discussion is generated, and can be shared by every person present, regardless of whether they have sight or not. Then we can naturally share the fact that "everyone's (view of a thing) is quite different." In that sense, disability becomes a catalyst. It is obvious that what we thought we shared is not actually shared. When people with disabilities join, the atmosphere becomes significantly active. I believe that it is extremely interesting that disability can fulfil such an important role. Dr. Asa Ito, project supervisor and facilitator Asaki Nishikawa (center right) and foreign graduate students and researchers. *Some of the reports by the participants in this project have been published. 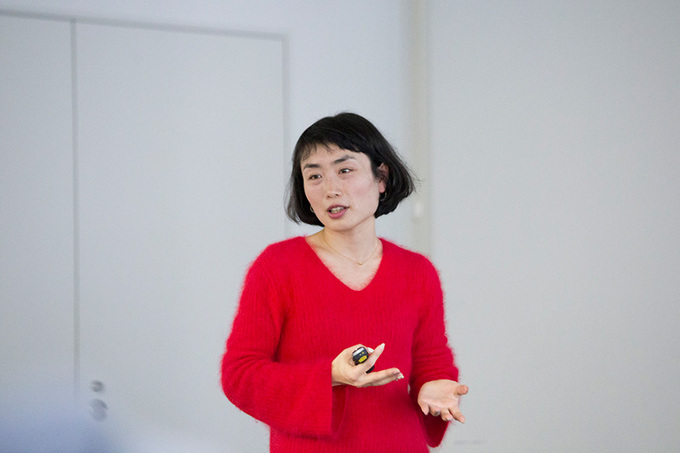 Asa Ito is an associate professor at the Center for Liberal Arts, Tokyo Institute of Technology, specializing in body theory and contemporary art. Her publications include Me no Mienai Hito wa Sekai wo Douyatte Miteirunoka [How do People without Sight See the World] (Kobunsha). Besides her studies, she is involved in producing workshops and creating artworks.